So many people may think that PlayStation 4 is a videogame console for "Adults", but this impression is misleading as there are dozens of consoles games targeted to children and youth of all ages. Ideal for parents to play with their children, or simply let the little ones play, the following list is full of fun family games focused on local multiplayer. Disney Infinity: Marvel Super Heroes is a blend of toy and videogame. Put the characters in the carrier and take them to the world within the game Disney Infinity 2.0. Live adventures alongside characters from the Marvel into a 3D action game with various possibilities of interaction. The game is punctuated by many built-in mini-games, but this second version brings unique campaigns for each kit. In addition to the Avengers, you can also play with characters from the Disney animations like Aladdin, Big Hero 6 and more. LittleBigPlanet 3 is a platform game in which the player creates buildings and solve puzzles to continue the adventure. While the first game was just a character, the current adds three new ones. But the highlight of this third edition is the ways to create stages and even games. You can create minigames and share your creations on PSN. Recently, LittleBigPlanet 3 received an update to the Frozen characters. In Plants Vs Zombies Garden Warfare, vegetables and zombies will face off in a shootout in which the maximum of violence that can happen is the turning vegetables salad. The shooter third person has great graphics and is all in Portuguese. With the ability to create unique rooms, only for selected friends to play with each other, teams can be formed in order to defeat opponents. As in the game for smartphones and tablets, in Garden Warfare, each plant has special abilities, like zombies. Learn to use each feature is essential to help your team in this unusual match. For those who love platform games, the tip is Rayman Legends. Entirely in Portuguese, including dubbing, the game can be magical for children. After all, a game that looks, sounds and entertains as cartoon is guaranteed fun. There are dozens of stages in a growing challenge. Although seem cuddly, Rayman Legends has some very difficult times. The game is recommended for children from 10 years. Knack is an action game in the third person in which the player controls a being made of relics called Knack. By collecting more of these objects, the character gets bigger and learn new moves. The game was one of the flagship at the launch of PlayStation 4, features an impressive visual and explores various features of the console. Knack has cooperative mode for two players to live a great adventure. Just Dance 2015 may not be the best dance game, but animates any party, including birthdays. In the game, players must reproduce the movements of the dancers to make points. You can use the smartphone as a control. Despite not having Brazilian music, the game features songs from famous artists and films like Frozen. 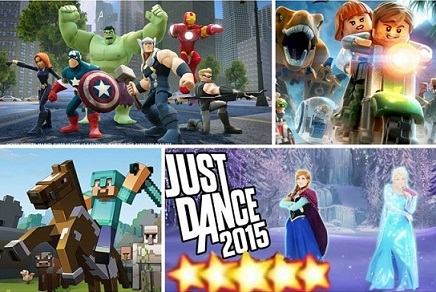 You do not want to buy Just Dance 2015? Then you can choose to download the free version for mobile phones, " Just Dance Now "and use the PS4 to play the game content on the TV. Who is gamer and already has children may notice the success of Minecraft, a game literally "without end." In it, the player can build what the imagination allows. The lack of objective hides a game where creativity is the mainspring of fun. Within this universe, children create, and things, their own stories. The version for PlayStation 4 allows local multiplayer and online. There are several unique skins with characters like Kratos from God of War and more. In the PS4 , the game is quite educational and tutorial there for just about everything. Hohokum is the most artistic game list. In this sensory experience, players do not have many goals, and need to interact with the environment to discover wonderful things. The introduction let anyone lost. However, the idea is to enable a great feeling of discovery. In Hohokum, the player must figure out how to get through the phases. Easy to play, the game is ideal to "awaken" the senses and show that interactive experiences can be simple and catchy without follow a script. In this game, players will relive scenes from the first three films of Jurassic Park. Many dinosaurs are waiting for you in another cuddly game of the LEGO series. Action-packed third-person, Jurassic World strictly follows the formula of other LEGO games, ie mixes humor with exploration, item collection and fighting without violence, after all, all the characters are made of LEGO toys. To end the list, could not miss a game the Skylanders series. Skylanders: Trap Team is a fun adventure in which players can control even the villains of the game. Although it has great graphics and charismatic characters, the highlight is the campaign with various forms of interaction between players. Enhancing teamwork, Skylanders: Trap Team is ideal to play with a friend.